The biggest news related to eggs is that they have been exonerated from the decadeslong accusation of engendering heart disease. Through study after study, it has been shown that saturated fat, not dietary cholesterol, is the main dietary risk factor for coronary heart disease. Scientific studies continue to show that total fat, especially saturated fat, intake is far more important in determining blood cholesterol levels than intake of dietary cholesterol. 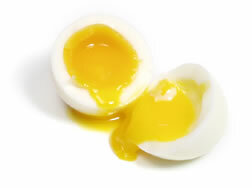 Of the mere 5grams of fat in an egg yolk, only 1.5 grams (31%) are saturated fat. Monounsaturated fats total 1.9 grams (38%) and polyunsaturated 0.68 grams (14%). The ratio of an egg's fat contents comes almost close to meeting the dietary proportions currently recommended - 1/3 saturated, 1/3 monounsaturated and a 1/3 polyunsaturated. All the fat and cholesterol of an egg are found in the yolk. The type of fat you eat is just as important as the amount. How Much Should We Eat? Saturated fats raise the blood cholesterol level increasing the risk of heart disease. Monounsaturated fats actually help lower blood cholesterol while polyunsaturated fats are also of benefit. Studies demonstrate that dietary cholesterol increases both LDL and HDL cholesterol with essentially no change in the important LDL: HDL cholesterol ratio. For example, the addition of 100 mg cholesterol per day to the diet increases LDL cholesterol by 2.9 mg/dL, but that is accompanied by a 0.4 mg/dL increase in HDL cholesterol. This, on average, means that the LDL: HDL ratio change per 100 mg/day change in dietary cholesterol is from 2.60 to 2.61, which is likely not even statistically significant and would probably have no influence on heart disease risk. Harvard researchers concluded that, for most healthy people, an EGG a DAY is Okay and will not increase risk of heart disease. Those who have risk factors for heart disease and stroke can work with their healthcare provider or dietitian to tailor menus to their own risk of heart disease and stroke, particularly in Limiting Saturated Fat Intake. Eggs have a high nutrient density because they provide high quality protein and a wide range of vitamins and minerals in proportion to their calorie count. Disease caused by one of the two poultry-adapted strains of Salmonella bacteria, Salmonella Gallinarium. This can cause mortality in birds of any age. Infections still occur worldwide in non-commercial poultry but are rare in most commercial systems now. Salmonella Gallinarium infects the chickenÃ¯Â¿Â½s liver, kidneys, spleen and the anterior small intestine. Morbidity is 10-100%; mortality is increased in stressed or immunocompromised flocks and may be up to 100%. The route of infection is oral or via the navel/yolk. The bacterium is fairly resistant to normal climate, surviving months, but is susceptible to normal disinfectants. At Kiepersol Poultry Farm (Pty) Ltd. we do preventative vaccination for the SG virus. Salmonella Gallinarium is specific for poultry and is 100% safe for humans since the virus can not be passed over to the egg. Salmonella Enteritidis and Salmonella Typhimurium are presented separately from other sero-types of Salmonella because, on the one hand, these bacteriaare often specifically cited in zoonosis control legislation, and secondly, because there are differences in the epidemiology as compared to other salmonellae. These are the predominant sero-types associated with human disease in most countries. Infections in chickens cause problems worldwide with morbidity of 0-90% and a low to moderate mortality. Many infected birds are culled. The route of infection is oral; many species are intestinal carriers and infection may be carried by faeces, fomites and on eggshells. Vertical transmission may be either by shell contamination or internal transovarian contamination of the yolk. Feed and feed raw material contamination is less common than for other sero-types. The bacteria are often persistent in the environment, especially in dry dusty areas, but are susceptible to disinfectants that are suitable for the particular contaminated surfaces and conditions, applied at sufficient concentrations. The inside of the egg was once considered to be sterile. But, over recent years, the bacterium Salmonella Enteritidis has been found inside a small number of eggs. Bacteria if they are present at all in the egg, are most likely to be in the white and will be unable to grow, mostly due to lack of nutrients. As the egg ages, the white thins and the yolk membrane weakens. This makes it possible for bacteria to reach the nutrient-dense yolk where they can grow over time if the egg is kept at warm temperatures. But in a clean, uncracked, fresh shell egg, internal contamination occurs only rarely. If the egg has been improperly handled, you might experience the food borne illness called salmonellosis. You could have symptoms of abdominal cramps, diarrhea, nausea, vomiting, chills, fever and/or headache within 6 to 72 hours after eating. The symptoms last only a day or two in healthy people but can lead to serious complications for very young, pregnant woman, the elderly, the ill and those with immune system disorders. Scientists estimate that, on average only 1 of every 20 000 eggs might contain the bacteria. So the likelihood that an egg might contain SE is extremely a small Ã¯Â¿Â½ 0.005%. At this rate, if youÃ¯Â¿Â½re an average consumer, you might encounter a contaminated egg once every 84 years. At Kiepersol Poultry Farm (Pty) Ltd. we do preventative vaccination for the SE virus. Why Eggs Are Good For You?